It's about a decade now since I last saw one myself and that was in the back garden when I lived just north of London. 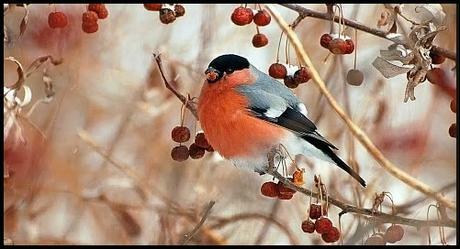 When it happens, it is quite a special moment, as bullfinches are bigger and brighter than robins. In fact if three or four arrive at once (collective noun - a bellowing), an even more rare occurrence, they look like candles aflame among the greenery. As my fellow bloggers have recorded, it is the RSPB's Big Garden Bird Watch this week-end. I've bought a new pole with hanging bird-feeders for my little Blackpool garden and I shall be spending the allotted hour tomorrow making a record of who pays me a visit to feast on nyjer seed and fatballs. I'm not expecting any bullfinches. February is bullfinch month - or more correctly the bullfinch is the featured bird of the month on my 2019 Birds On The Wing calendar. Local folklore has it that the flame-coloured finch is a harbinger of spring. It's surely not going to happen next month, but give it a few weeks more and sightings of the elusive fellow will increase in tandem with the days warming up. 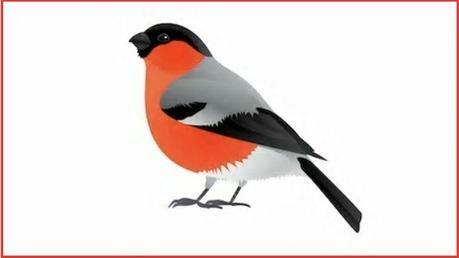 When the time is right, the unbeliever and I will go bullfinch spotting once more. And so to the poem, not about bullfinches but at least it's on an avian theme in honor of the big garden birdwatch weekend. It harks obliquely back to that rather cruel old French-Canadian children's song Alouette and is something I started writing one fine morning last summer but have hastily finished in time for today's blog. silhouetted against first golden light. can't we please doze one cosy hour more? Why must you break so lusty on our dreams? to recommence our busy waking frets. beak, eyes, neck, wing, legs, tail and back. Spring....but Has It Really Sprung ?